FREE COMIC BOOK DAY @ HEROES :: TOMORROW! 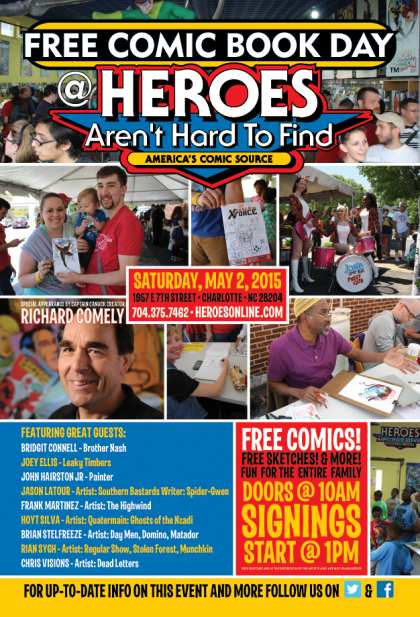 Free Comic Book Day 2015 at Heroes is TOMORROW! Come out and meet amazing comic artists, get free comics and have a great time with your pals at Heroes Aren’t Hard To Find! Check out our awesome guest list below! Unfortunately, Sanford Greene had to cancel his appearance this year. 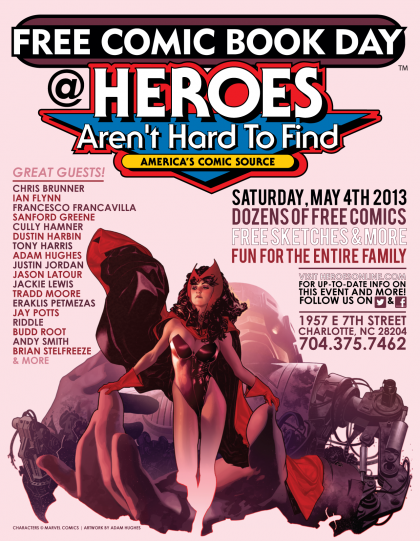 FREE COMIC BOOK DAY AT HEROES :: THIS SATURDAY! 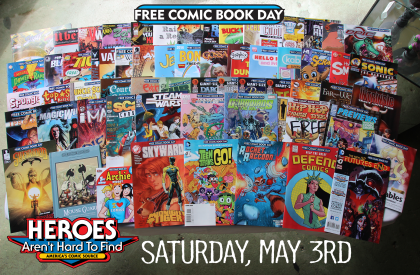 Here’s your guide to the FREE COMICS we’ll have on hand this Saturday, May 3rd at our FCBD event! Doors open at 10AM; get here early to make sure you get the books you want! *Please be respectful of others when making your selections, supplies are limited and we want to make sure as many people as possible get the comics they want. Taking multiple copies of one title is not nice! Neither is pushing while in line. Be respectful of the people around you and we will all have a great time! 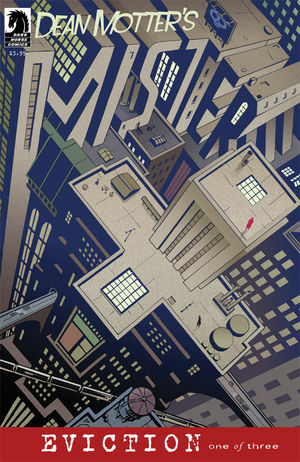 Our incredible list of comic creators will be signing and sketching from 1 – 5 (or longer at the creators’ discretion). Remember that free sketches are done at the discretion of artists, and are not guaranteed. In addition to all the Free Comics and great artists, we’ll also be debuting a brand new, never before touched sale stock on Saturday! More specifically, this is a 27 box dollar stock that happens to be in alpha-numeric order. That’s right, it’s all in alpha-numeric order! Buy single books for $1 or fill a long box for $250. We haven’t debuted anything like this in quite some time, so bring your back issue want lists and enjoy the ease of shopping through an organized stock. PARKING: This is always a big question for FCBD attendees. We want you to know there are plenty of parking options for Saturday. You can park anywhere in the lots directly beside or behind Heroes without the threat of being towed. This includes in front of any of the businesses from Dollar General down to the former Florist, including the small lot on the other side of the Florist. Our neighbors are kind to let us use their spaces for their event, so please patronize them on Saturday. We would love for them to see a little extra business from our FCBD crowd. This is our largest store event of the year, and these lots may fill quickly. The good news is that Saturday’s weather is supposed to be perfect for the event. If and when these lots fill up, remember that you can park on any of the surrounding streets behind Heroes. 8th Street and beyond has plenty of on-street parking, and it’ll be a beautiful day to walk a block or two to Heroes. There are a few places you cannot park. Those are the four spaces directly in front of the Laundry in the lot next to Heroes, and in any of the spaces across Pecan at Pecan Point. This includes all of the parking spaces in the shopping center including businesses like Anntony’s Caribbean, Bang Bang Burgers, and around to Sunflour Bakery. You will be towed at your own expense if you park in any of those spaces, so heed that warning now, and remember it on Saturday. We expect hundreds of people to pass through Heroes on Saturday, but there are many more parking options for you this year. As with your actions in the store, we would appreciate you being respectful of our neighbors, parking lot, and neighborhood. This is a large and busy event, but it’s one designed to be enjoyed, and we can all work together to make sure that happens for everyone.